Throughout the galaxy, Emperor Palpatine’s Galactic Empire has created an atmosphere of suffocating fear and submission. No one dares to speak out, and those who do are quickly and efficiently silenced. These terror tactics are the work of the Imperial Security Bureau, the Empire’s secret police. Anyone you know could secretly be an ISB agent, and these agents are renowned for their lack of moral compunctions. Only the most foolish Rebels would dare to take the ISB lightly. Today, we’ll preview the Agent Blaise Villain Pack and see what you can expect to face when you go toe-to-toe with the ISB on Bespin! 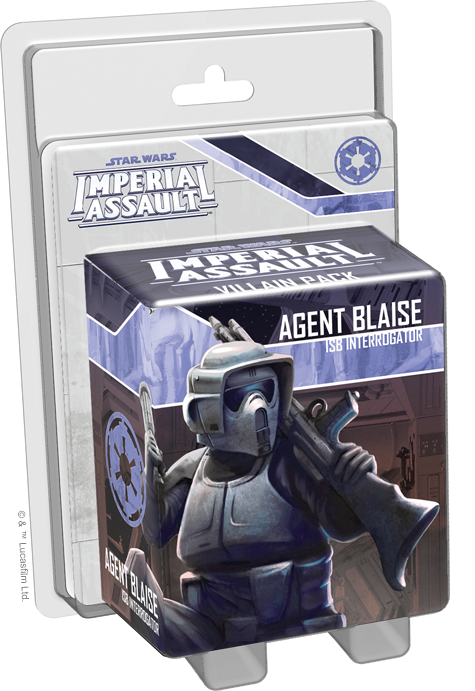 Like several other heroes and villains from Imperial Assault, Agent Blaise features different versions for your campaign and skirmish games. In your campaigns, Agent Blaise works from behind the scenes, dispatching other agents into action and menacing the heroes with his veiled presence. Agent Blaise begins by offering a full range of four different surge abilities. He can surge to deal extra damage, to pierce armor, or to improve the accuracy of his shots, and with a green die and two yellow dice in his attack pool, Agent Blaise will be triggering these surge abilities more often than not. Agent Blaise can also spend a surge to trigger his Menace ability, which immediately increases your threat by one! Obviously, giving yourself the resources to bring better units into play is extremely helpful in your battle against the Rebels on Bespin, and Menace makes it easier to get the figures you need when you want them. As you gather more threat through Agent Blaise’s menacing tactics, you can suddenly bring new forces into play with Activate Agent. 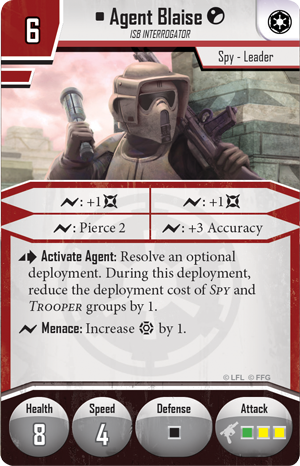 As an action, you can use this effect to immediately resolve an optional deployment with reduced deployment cost for your Spy and Trooper groups. In most circumstances during a campaign, you can only deploy new units at specific points in the scenario, so the ability to deploy new figures whenever you have the threat makes Agent Blaise one of the most versatile figures in your strike team. 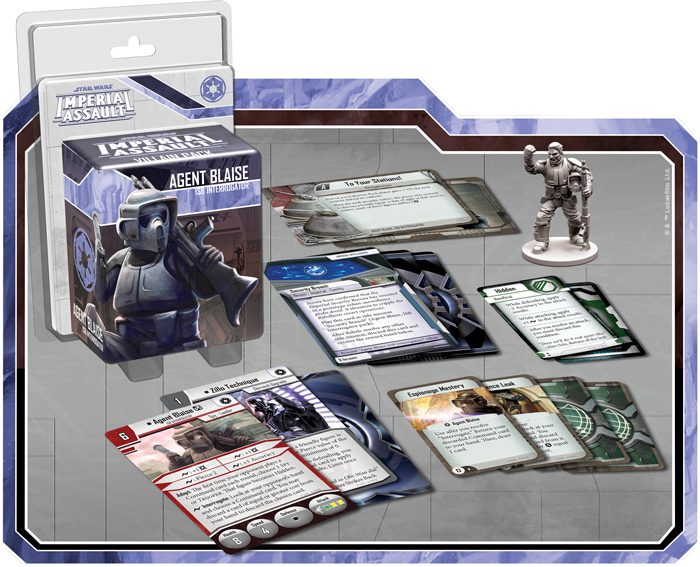 Your Imperial Assault campaigns can also benefit from the addition of a new three-card Agenda set introduced in this figure pack. A new Agenda mission invites you to defend an Imperial facility holding blueprints of an urban-surveillance probe droid—a tempting target for any Rebel strike team. The other Agenda cards invite you to capitalize on your knowledge of Rebels tactics. Under Surveillance lets you collect information on the Rebels’ attack patterns and put your intelligence to use inflicting strain on the heroes. Classified Techniques , on the other hand, is one of the most multi-purposed Agenda cards in the game: it allows you to ready any one of your Class cards to trigger a powerful ability twice in the same round. 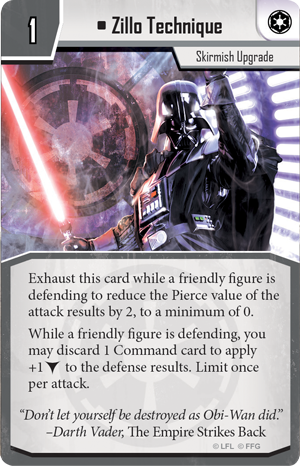 No matter which Agenda cards you use, you can use the might of the ISB to crush Alliance forces across the galaxy. Agent Blaise can be just as dangerous in a fast-paced skirmish as during the longstanding action of a campaign. Though the skirmish version of Agent Blaise features the same health, speed, defense, and attack as the campaign version, his major abilities have some key differences. 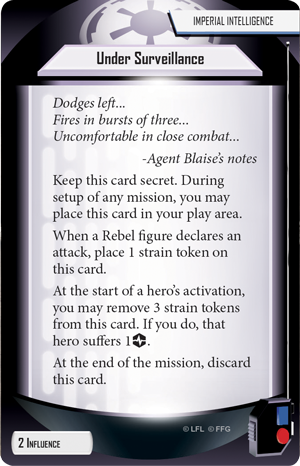 Most of Agent Blaise’s surge abilities are unchanged in the skirmish game, but the Menace ability has been replaced with Interrogate. 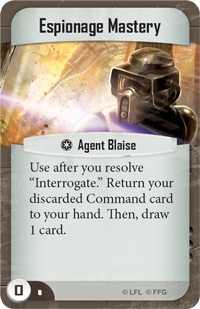 By spending a surge to trigger Interrogate, you can look at your opponent’s hand of Command cards. Then, so long as you discard a card of equal or greater cost from your own hand, you can discard a card of your choice from your opponent’s hand! Even if you don’t choose to discard a card, knowing what tricks your opponent has available gives you a significant advantage in a match. Combine that with the ability to discard your opponent’s most threatening card, and you can see why Agent Blaise offer unmatched intelligence to Imperial forces. You can also take advantage of Agent Blaise’s Adapt ability when your opponent does play one of his Command cards. 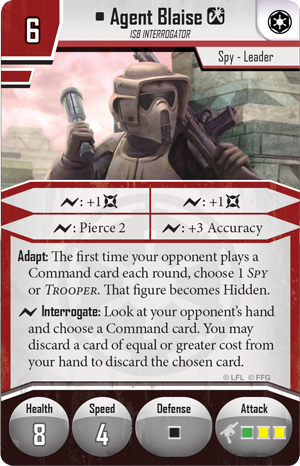 The first time your opponent plays a Command card each round, you can choose a Spy or Trooper figure. That figure immediately gains the Hidden condition, making it more difficult for your enemies to pin down and destroy. The Agent Blaise Villain Pack gives you another way to keep your strike team intact with a new skirmish upgrade. Zillo Technique is a unique upgrade that can be exhausted when a friendly figure defends in order to reduce the pierce value of the attack, ensuring that your armor holds fast against enemy attacks. What’s more, once per attack, you can discard a Command card to add an extra block to your defense results. If your strike team focuses more on attack than defense, a card like Zillo Technique can give you the extra strength you need to survive. 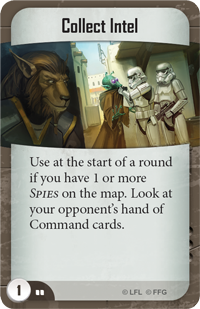 The Command cards introduced in this figure pack also give you ways to gain intelligence about your opponent’s Command cards. 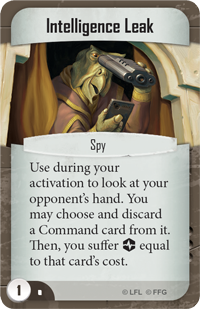 Collect Intel can be played so long as you have a Spy on the map, and it allows you to immediately look at your opponent’s hand of Command cards. Intelligence Leak can be used to look at your opponent’s hand and discard any card, provided one of your Spies suffers strain equal to that card’s cost. Finally, Espionage Mastery helps repair the card disadvantage of using Agent Blaise’s Interrogate ability. By playing Espionage Mastery after you resolve Interrogate, you not only return your discarded Command card to your hand, you draw a new card as well. Ultimately, this Villain Pack gives you unparalleled control over the cards in your opponent’s hand, helping the Empire destroy all who stand in their way. In the halls and corridors of Cloud City, a secret war is waged between Rebel operatives and the ISB. Fight for the Imperial Security Bureau with Agent Blaise, and join us in our next preview for a closer look at his spies—the ISB Infiltrators!